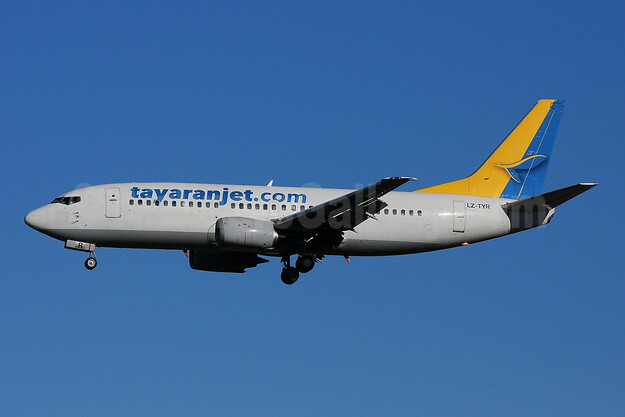 Tayaran Jet (Sofia) is a new airline in Bulgaria with two Boeing 737-300s. On November 26, 2018, the new charter airline started operating for Ernest Airlines with an aircraft and crews based in Tirana, Albania. The crews will be based in Tirana until the end of January 2019. The carrier has been operating for Ernest since August. The first flight was flown on July 24, 2018 (below). Tayaran Jet was founded in 2017. The trademark property “Tayaran Jet” belongs to the company Tayaran Holding Ltd based in Malta. Tayaran Jet is 100% owned by Tayaran Holding Ltd.
TYR (msn 25414) BLQ (Marco Finelli). Image: 944739. This entry was posted in Tayaran Jet (tayaranjet.com) and tagged Boeing 737-330, LZ-TYR, msn 25414, Tayaran Jet (tayaranjet.com) on December 11, 2018 by Bruce Drum.